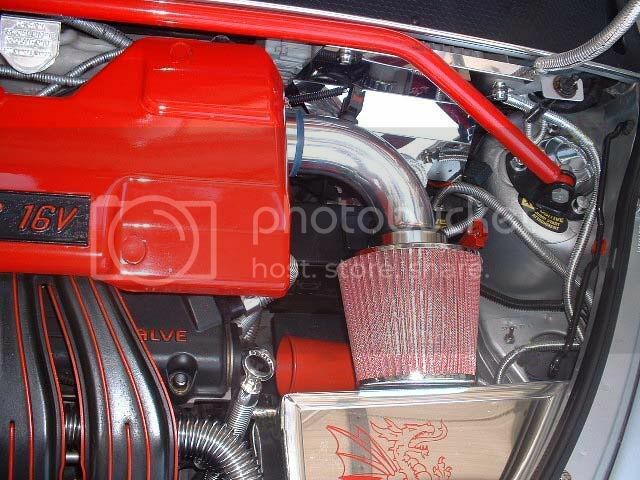 Hi you guys...I was thinking about modifying my intake on my Pt. Is this worth it ? any increase or decrease in gas Mileage ? which one should I take...I'v check on Ebay and there is some starting as low as 10$ plus shipping...is this good enough ? thanks for you help. Lots of pros & cons from owners on that question. I have one like you see on eBay but the guys that are after every ounce of power from their 4 banger say that the open element filter draws in too much hot air from the engine, thereby decreasing HP. The more costly open air elements like Volant, K&N and Air Raid put the filter in an enclosed area to ward off the hot air. Some say you can't do better than the stock air filter box with modifications to let it breathe better ie: K&N filter, larger snorkle, removing white rings. All the aftermarket filters make it a little bit more noisey as you can hear the air rushing in when you have your foot to the floor. Some have said they've seen an increase in MPG by 1 or 2 miles. if you have one does your engine runs the same as stock ? no hesitation or prob with it ? is it safe to put one...is hard to do ? any pics of you instalation..? The cheap one's are pretty easy to put on. They should come with two holes in them for the plastic breather tube and the IAT connector. Pull those two things off the old air filter parts and then take anything to do with the OEM filter off the car. The new filter and connector tube will fit right onto the throttle body with the blue or red rubber connector and two hose clamps. The two things that you pulled off the old filter will now fit right into the holes in the new connecting tube. You can just see the IAT connector that plugged into my chrome tube right before it enters the throttle body. wow nice engine compartment...[?] thanks for the info...I will order one and try it on...I' affraid to damage my engine ,l've never done that before but I see on multiple Pt so it should be ok. Do you realy see a diff in horpower or torque ? Do I see a difference? NO, and most of the go-fast goodies that you can buy won't give you a kick-in-the-pants kind of power. The one exception to that is Stage 1 for the turbo models. It does let the engine breathe better, and I personally noticed that it pulled better off the line right up to red-line. Just make sure your plugs and wires are in good shape to let the engine make the most of the additional air-flow. It sure does sound nice though. I had a Airaid air filter on my 02 and it increased my highway milage by 3-5 MPG. Of course it wouldn't fit my '06 so I have ordered one similar to Crewzin's. Hope I can increse the MPG with it. Power was not increased that I could see on the '02!! CREWZIN hit the nail on the head. As for an increase in mpg. The only things that will give you your best mpg is a well tuned car, a light foot and proper tire inflation. Anything else is a pipe dream.